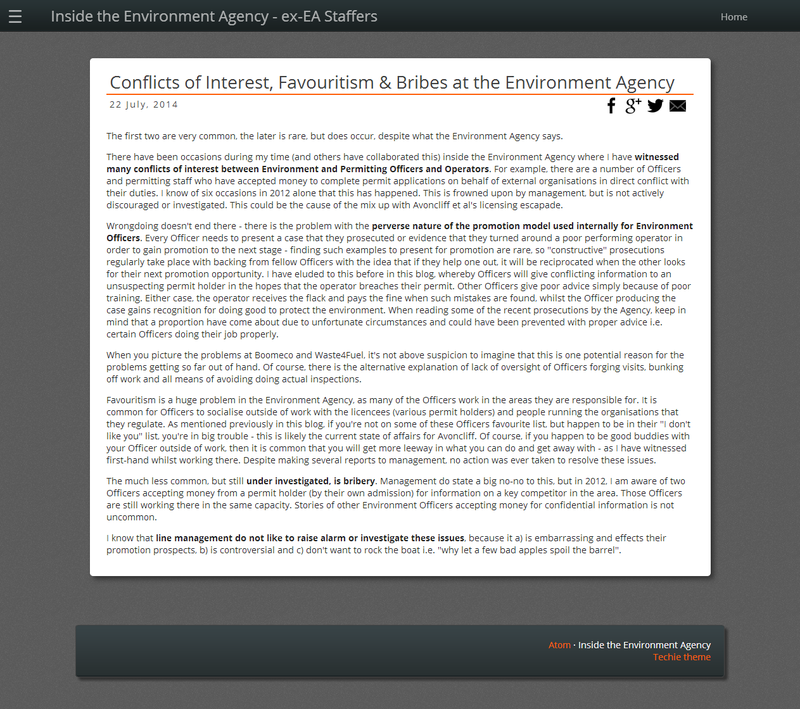 Henry at Inside The EA has a couple of recent posts up about conflicts of interest, bribes, favouritism and an inconsistent regulatory approach - describing actions known to him when he was actually inside the EA. Whilst it is gratifying to see our prejudices verified - what is not gratifying in any way shape or form is to see criminal behaviour perpetrated by public officials not being addressed and dealt with. We are now approaching 5 years down the line, a show-piece project which ticks the "public interest" boxes for green energy, industrial heritage and maintenance of infrastructure - has been obstructed mostly by foul means to indulge the whims of corrupt, arrogant and self indulgent officials - who, in order to spitefully cause harm to the project at North Mill - have connived to award a water licence to somebody that doesn't own the property in question and presently has no legal right, title or covenant in place which allows legitimate work to progress. i.e. they've awarded a paper licence out of - yes....sheer undiluted spite (using your money!). This was supposed to be a water licence application - but officials have turned it into an expensive circus. The final cost of this mess - to the public purse alone is now likely to exceed £2 million pounds. The EA officials conniving, dishonest actions were unlawful the first time around and that cost the public a pile of money - they did the same thing again and they have twisted every facet of the water licence process this, second time through the process - to impose an arbitrary and very deliberately crippled outcome. No doubt the departure of Owen Paterson from DEFRA has signalled for some in the EA a return to the good old days of nil oversight and an ever increasing budget. The EA needs root and branch reform - or a reboot. That dishonesty, cheating, fraud and just breathtaking indolence are easily identifiable in a public body is bad enough - that it is tolerated by management is simply wrong. That the EA are in charge of "waste" is an almost unbearable irony! There is more woe on the way for EA officials - I hope that instead of "lessons learnt" and back to work - that the quite astounding carnival of abuses of position and process are addressed robustly. And the question has to be asked - who's going to replace Chris Smith eh? To the politicians reading this blog - do you think it's acceptable that abuses like those documented here and in other places are allowed to continue? Are self indulgent abuse of power, contempt for the law and wholesale cheating by unelected public officials/servants (?!) acceptable? Owen Paterson is on the shortlist for EA Chairman! That'll induce some incontinence at Horizon House. What idiot would do that issue a paper licence? One can only wonder at the belligerent finangling that certain officials have indulged in to get their way and the increasingly tortured advocacy and wholesale mendacity involved. The strategy seems to be that licence applications are a combative process and that a Pyrrhic victory for an applicant is regarded as a "win" for a bunch of out of control self indulgent bureaucrats splurging other folks money. The trouble is TOM the idiots are being paid by us the tax payer. Have had an hour on insidetheea web site looks like its all the way up to the top,Cameron needs to get a grip, the trouble is is Liz Truss up to the job lets see. Heh... Ms. Truss is absolutely untested in a position where she has to deal with something going very wrong and requiring research in depth and robust well directed action. She also has - as a new minister - hundreds of "campaigners" from (often taxpayer funded!) NGOs braying at her via any avenue open to them - i.e. Twitter and Facebook.